Curious about Cosplay? Learn all the basics of Cosplay here straight from experts in the heart of Tokyo! Japanese Cosplayers continuously take the art of Cosplay to new levels and now you can learn their secrets! 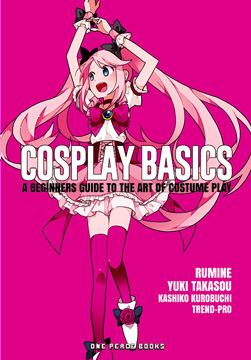 Cosplay Basics has collected all you need to know in an easy-to-follow how-to book on the making and engaging in the art of Cosplay. With original designs and patterns so you can learn how to make your own. Yuki Takasou is an avid Cosplayer and costume designer. She spends her time offering help and advice to other fellow Cosplayers, such as creating free costume patterns. She also actively helps supports the Cosplay online community by offering help to dedicated start-up Cosplay websites. RUMINE is writer, designer and teacher. She is an aspiring actor and voice actor. She enjoys and supports the Cosplay community and regularly receives new orders for her original costume designs.